Frederick W. Daily is a tax attorney with over 35 years experience helping individuals and small business owners make smart tax decisions and stay out of trouble with the IRS. He has been featured as a tax expert on Good Morning America and NPR, and in publications across the country including Money Magazine, U.S. News & World Report, Newsweek, the New York Times, and the Chicago Tribune. 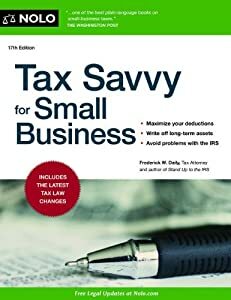 He is the author of Stand Up to the IRS, Tax Savvy for Small Business and Surviving an IRS Tax Audit. Jeffrey A. Quinn started his career in the San Francisco office of PriceWaterhouseCoopers (formerly Price Waterhouse) in 1970, upon graduation from the University of San Francisco with a degree in accounting. He is a Certified Public Accountant in both Nevada and California, and also holds a Masters of Science in Taxation degree from Golden Gate University, in San Francisco. He is a member of the California Society of Certified Public Accountants and the American Institute of Certified Public Accountants. He has authored weekly tax columns in the North Lake Tahoe Bonanza for nearly 40 years.